Recently we have had our Class reunion (Physics Department of the renown St. Petersburg University, Russia). Amidst all the warm greetings, embraces, and gasps of surprise at the view of receding hair, bulging waistlines and other signs of relentlessly encroaching middle age we swapped the tales and had come to a rather unsurprising conclusion: if you are still in science, it means you are working abroad, if you are still in Russia, it means you are not in science. Indeed, in the wake of rapid changes that swept over the former Soviet Union following its disintegration in 1991 millions of people who formerly had positions in the vast scientific and technical establishment have found themselves adrift without any conceivable means of support. Many have been forced to abandon science for good and to seek opportunities in the burgeoning private sector and quite a few have achieved spectacular successes in their new business endeavors. Their names are well known and their future appears to be bright. This article though is not about them. It is about those stubborn individuals who despite overwhelming odds have kept their faith and commitment to science, who went on and persevered. It is a tribute to those who remained fully engaged in research and upheld the traditions of Russian school, who have faced and overcome all the innumerable obstacles such as delays in salary payment, aging physical plant, accident-prone electrical, water and heating systems, dearth of funding, etc. It now seems, that thanks to the selfless effort of these remarkable individuals Russian science is finally turning the corner and that things are indeed getting better. This article is homage to all the scientists in the FSU whose inquisitive minds and boundless thirst for knowledge have preserved and strengthened the glorious traditions of Russian science through all these years of troubles. 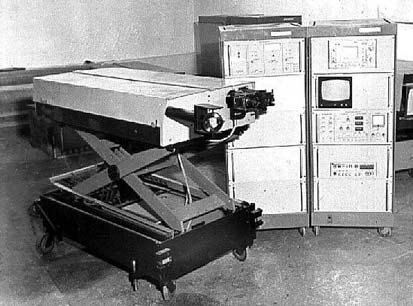 When one starts describing the state and recent achievements in the field of holography in Russia, the first thing that should be mentioned in retrospective is that holography in opposite beams was invented there in 1962 by Prof. Denisyuk whose holographic likeness can be seen in Fig.1 His groundbreaking work  describes a method for recording of holograms that can be reconstructed in white light. Most of the current commercial holography is related to this type of recording. 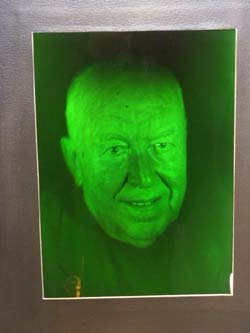 Fig.1 Holographic portrait of Prof. Yuri Denisyuk. Courtesy of State Optical Institute (St.Petersburg, Russia). This pioneering work served as a foundation for a host of fundamental contributions made by the Russian scientists to the theory and practice of holography. The theoretical description of holography have been formulated in the works of Profs. Denisyuk, Soroko, Zel'dovich, Sidorovich and others. Prof. Ostrovskii, Ostrovskaya and their colleagues have developed theory of holographic interferometry. Russian scientists have also been very successful in practical aspects of holography especially in development of high resolution sensitive holographic films and plates. The micro grain ArBr photoplates for holographic recording have been developed independently by Prof. Kirillov and Dr.Protas. The factory "Slavich" located 130 km north of Moscow now commercially produces these plates as well as dichromated gelatin ones (http://www.slavich.com/). They have official distributors all over the world: in Lithuania, Germany, United States, Japan, India, and South Korea. Currently "Slavich" is the only commercial producer of holographic ArBr photoplates in the world. As their traditional sources of funding disappeared with collapse of Soviet Union, the researchers and engineers have been forced to look for new sources and have found them in all the different places. Current research gets financial support from both internal funding like Russian Foundation for Basic Studies and from international foundations: Civilian Research and Development Foundation, US Air Force, Navy and Army funding via European Office in London and International Science and Technology Center in Moscow, from the European grants from INTAS, Copernicus, and other. Besides the Governmental funding there are also direct contracts with Western and Far Eastern commercial entities. Geographically the holographic research and commerce are spread out across the vast expanse of Russia and other FSU states. While historically Moscow region have always been the center of all scientific activities in Soviet Union, and holography is not an exclusion, surprisingly large number of strong and dynamic research groups can be found in a number of diverse places such as St.Petersburg, Novosibirsk, Samara, Irkutsk, Nizhniy Novgorod, Ryazan', Chelyabinsk, Vladivostok as well in other FSU states and let us now embark upon a short journey across the "holographic landscape" of FSU. 1. The holographic studio at All-Russia Exhibition Center, Moscow. Located to the north of downtown Moscow in a setting that once served as a showpiece of the achievements Soviet economy, the Holographic studio (www.holography.ru) headed by Dr. Sergey Vorobiev produces and sells the highest quality traditional image holograms on ArBr and dichromated gelatin plates and films. 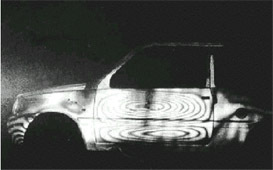 An example of the holograms taken by this studio is shown in Fig.2. Thanks to the Internet one can now easily purchase a hologram on-line using a credit card. A framed hologram similar to the ones shown in Fig.2 costs from $17 to $105 depending on size ( from 9x12cm to 28x40cm) with world-wide free delivery. This web site sells several hundred holograms per months; the most popular are the ones with pets. If one wants to immortalize his/her image or the loved one in three dimensions, it can also be arranged at the Studio at the All-Russia Exhibitor Center, and also at another Moscow location - the studio at the at Cinema and Photo Research Institute. A 30x40 cm holographic portrait can be recorded for a rather moderate price of $100, while getting comparable service in US and Europe typically would set you back $500-$1,500. In addition to serving as an advertisement and marketing site, the website of the Holographic studio also provides a multitude of free information and service, such as on line discussion forum, beginners support, holography news, on-line tutorials and many others, both in English and Russian. One can also download a holographic screen saver from this site. The studio also teaches the amateur holographists to record holograms using the laser pointer, a set of lenses and a photographic plate. An easy, durable and cheap holographic setup for kids with a standard 3$ laser pointer is available for sale. studio at All-Russia Exhibition Center, Moscow. CRST (formerly known as KRYPTON)( www.crst.ru, krypto@orc.ru ) has been a leader in the commercial holography production in Russia since 1996. CRST has received international recognition - as a member of IHMA, CRST was among the 1999, 2000, 2002, 2003 and 2004 Holography Award Winners in category "Authentication & Security". The core business of CRST's is in applications of holography to security and authentication. CRST manufactures a large number of diverse Security holograms using the results of the in-house research and development. CRST's origination laboratory uses all advanced optical technologies: 2D/3D images, E-beam (0.2 um), DOT-matrix (equipment is from Poland), stereograms and kinetic effects, covert images, as well as the latest know-how: combining of laser and e-beam origination techniques for manufacturing of high security holograms. The embossed holograms are up to 300mm width. The R&D effort has benefited greatly from the creative incorporation and conversion of the products and processes originated in the FSU vast armament industry. In addition to fabrication of holograms CRST is also involved in commercial production of opto-electronic components and systems for the identification of security holograms. CRST has its representative offices in 7 regions of Russian federation. The web site of the Media-security, Inc. ( http://www.media-security.ru/) led by Dr Yuri Vigovsky contains plethora of useful information of security holograms and beyond. Unfortunately the website of this company is mostly in Russian, and I hope it will change in the nearest future. Among the most interesting features of the web-site it that is has on-line proceedings of the celebrated "School of Holography" workshop - an annual week-long event held in various cities in the former Soviet Union that took place in 1980s-1990s under the leadership of Prof. Skrotskii from Moscow Physical Technical institute. I have nothing but the fondest memories of these workshops that used to give the beginning scientists like me a rare opportunity to listen to the lectures given by the most renown specialists in the field and to participates in the debates and discussions that took place afterward. Aside from being engaged in selfless dissemination of information about holography Media-Security is involved in a variety of commercial activities. As it names indicates, the main market for the company is in counterfeiting prevention, advertisement and marketing. The largest customers are producers of alcohol, audio-video CD, document security, permissions, concert and other entertainment venues tickets, microchips, wrapping for the specialty grocery items (coffee, tea, mineral water, etc.). One should mention unique (and rather expensive) holographic stickers for airplane turbine engines that survive at up to 260oC. Media Security designs and fabricates holograms of all of the above applications characterized by a very quick turn around cycle - a master hologram is typically produced in 5 days from receiving the order and the first 5 million of embossed holograms can be delivered within following 3 days. Media security offers holographic stickers with size in the range from 0.05x0.05mm2 to 260x260mm2. It also supplies and services equipment for the mass production of holograms. This equipment, developed and produced in their facilities, is equivalent and compatible with James River Products, Inc. meanwhile being several times less expensive. In addition it is involved in development of the full production lines that include not only fabrication of the hologram but also it's affixing to the bottles and packages at speed of up to 40,000 items per hour. E-beam technology is developed with a Gauss laser beam shape that allows improving the accuracy up to 0.001um. 4. State enterprise, ScientificTechnical Center "Atlas"
Atlas located in Moscow with its affiliation in 41 other cities is a state enterprise specialized in Government protection from counterfeiting. It controls the market of alcohol stamps, and this is the reason that Atlas is probably the largest, if counted by square meter, producer of embossed holograms in Russia. The company works closely with the variety of Government Departments such as Federal Security Agency, Federal Agency of the Government Communications and Information in President' Cabinet and many others. The main target of the company is to protect Government documentation. Located in the city Dubna (near Moscow famous for the nuclear physics research) this company produces 2D and 3D embossed holograms up to 150 mm width on their equipment. Located in the city Zhukovsky near Moscow, the Institute had been the leading site of all the Military and Civilian aviation research in the Soviet Union. It was one of the pioneers in the development of holographic methods for nondestructive testing and evaluation of the materials used in airframes. Now the group of Dr. Vladimir Pisarev (dzuba@tsagi.rssi.ru) is building on this work and is expanding its applications to the fields other than aviation. The group has developed novel means of probing the elastic-plastic material deformation using holographic interferometry with subsequent digital image processing. Using the technology one can study the the processes of cracks nucleation and growth in the local contact points of bolts and rivets, residual stress in welding, in cycle loading, and others. This location had been a premier site of research and development in motion picture technology in the Soviet Union. Some of the research was quite advanced and included development of the three-dimensional and holographic cinematography. 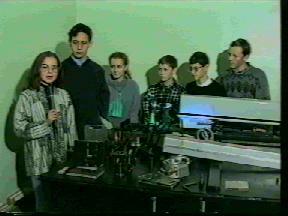 First holographic motion picture was filmed and processed back in 1976 under the leadership of Prof. Komar. The work continued after the Soviet Union demise and had won international recognition. In 1991 NIKFI received and Oscar from American Motion Picture Academy in 1991 for achievements in three-dimensional cinematography. Currently the holographic research at NIKFI is being performed by the Artistic Holography Group headed by Dr. Yuri Ovechkis. The effort is focused on the improvement of holographic emulsions, hologram processing, and the diffraction efficiency, brightness, sharpness and overall quality of reconstructed images. 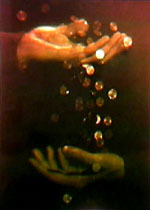 The art works of his group can be bought thorough the very well organized web site www.holography.ru mentioned above. The famed Levedev institute has always been and remains the flagship of fundamental physical sciences research in Soviet Union and Russia. Optics and more specifically holography have always played a major part among the activities taking place there. Currently the focus of that research is on waveguide holography and most of the activities are taking place in the laboratory headed by Drs. Andrey Putilin and Alexander Chernopyatov . Institute of Opto-Neural technologies http://www.iont.ru/ is led by Prof. Andrei Mikaelian. The R&D is directed on fundamental studies of novel technologies for information storage and processing based on the means of optical memory, neural networks and holography. An unique computer based technological complex is developed that allows to manufacture optoelectronic components with the resolution of 10nm in depth and on surface. The whole process includes the computerized synthesis of the component, materials deposition, electronic beam lithography, chemical and plasma processing. The developed methods are used for creating the matrices of nanoholograms, multifocus lenses, laser beam splitters, photonics crystals of X-ray range and others. Founded in the middle of WWII the MIFI have always served a most prominent educational establishment in Soviet Union and is currently it has strong educational effort in a variety of fields, including Holography. Group of Prof. Alexandr Larkin is actively involved in study of holography in Optical signal processing, neural networks. Computer holography center http://www.computer-holography.com/ is a pioneer of e-beam origination technology. Origination process offers many possibilities for combining various security features. Security holograms produced using the proprietary origination technologies are characterized by the rainbow images, true color images, 3D images, switch effects, animation and other features. Russian Emperors still rest in the St. Peter and St. Paul Cathedral. The State Optical Insitute named after Sergei Vavilov is often warmly referred to as a cradle of optical science in Russia. During the Soviet time it was renowned for the groundbreaking works in art holography, holographic diffraction elements, the holographic correction of light distortions and many others. Like the rest of the FSE Scientific Establishment, the Institute went through the difficult times in 1990's when due to the lack of financial support a number of promising research and development activities were discontinued. Salvation was sought and found in doing joint industrial research and development with western companies. Among the collaborations developed the one with Corning Inc was the most extensive and was formalized when Corning has officially opened its branch at SOI with a purpose of harnessing vast knowledge base at SOI for the optical communication applications. Within this framework the group of Prof. Sukhanov had developed a number of promising technologies, such as, for instance, holographic elements in porous glasses. Unfortunately, the joint effort with Corning was dramatically scaled down following the Telecom bust of 2001. Dr. Alexandr Pavlov and his group have developed a set-up for simulation and investigation of holographic methods for realization of fuzzy sets algebra operators. The test bed is assembled by a Fourier-holography scheme, and it allows to simulate operations of an algebraic model with two F-dual determining operations (semi-groups) and operators of parametric fuzzy logic for true spaces [0,1] (multi-valued) and [d,I] (fuzzy valued). Another illustrious address on the scientific map of the FSU the Ioffe Institute (http://www.ioffe.rssi.ru/) is well known for its pioneering work in semicondutor lasers which was recognized by a Nobel Prize awarded to the Institute Director Prof. Zhores Alferov in 2000. But the scope of research conducted at Ioffe institute extends far beyond semiconductors and includes holography among its directions. Laboratory of Holography at Ioffe institute is headed is Prof. Yuri Denisyuk whose name requires no introduction. An overview of his work was recently published in SPIE Proceedings, Volume 4737 , "HOLOGRRAPHY: A Tribute to Yuri Denisyuk and Emmett Leith", Editor H.John Caulfield, Orlando 3-4April 2002. His recent research is on second harmonic optical wave generation by cross-correlation of reference and object waves. This type of hologram operates on a femtosecond scale and can be instrumental in the development of ultra fast optical elements. Another holographic group led by Prof. Galya Ostrovskaya is focused on holographic interferometry, interaction of high power radiation with media, and shock waves analysis. Recent works by Dr. Semenova are devoted to dynamic holographic compensation of air turbulence. Located some 40 miles from St. Petersburg, in Gatchina, former home Emperor Paul I, Institute of Nuclear Physics, its name notwithstanding, is involved in a number of activities in other fields including holography. One of the labs headed by Prof. Boris Turukhano (http://dbserv.pnpi.spb.ru/~himslab/welcome.htm ) is a recognized leader in the precise length (~ molecular resolution, submicrons) and angle measurement devices based on moire effect in two holographic gratings with 1000 lines/mm. The lab has unique underground facilities with huge marble optical tables for recording of holographic gratings up to a meter long. The laboratory was build under a special order and financing from the cabinet of Nikolai Ryzhkov, the Head of Council of Ministry in Russia in 1990s. The lab also produces its own ArBr emulsion and holographic plates. Another St. Petersburg company involved in the development of artistic holograms and recording equipment is Lasersoft http://www.artlaser.com/hologram.html headed by Director Dr. Alexandr Skripchenko. The company is ready to provide various degrees of assistance in setting up a holographic studio for the shooting of the three-dimensional portraits, still life and advertisement. LaserSoft has developed a family of low cost high performance pulsed lasers for holography capable of emitting pulses of 20ns and less duration. Such laser facilitates creation of high quality holographic portraits of humans, as well as recording of fast processes such as bullet flight, explosion etc. A typical $35,000 LaserSoft laser matches performance of other manufactureres' lasers with price tag of $200,00 an more. The company also offers for sale a compact and mobile studio GRIF for holograms and holographic portrait recording. The company is looking for investments ~300,000$ to produce and sell multicolor holographic studios, a novel generation of holographic portrait studios, the main investment will be directed to creation of RGB pulsed laser. Founded in 1991 HoloGrate ( www.holograte.com) is yet another company that continues the proud traditions of the old St. Petersburg school of holography. The company's spatiality is in manufacturing of all kinds of holograms (both mastering and replications) on the base of metallized and transparent materials in the form of foil for hot stamping and self-adhesive labels. HoloGrate engineers have mastered the production of holographic materials for cold lamination and flexible packages where all holographic protective properties can be transferred. The company uses Chinese equipment with up to 600mm width production line. HoloGrate also manufactures plane and concave holographic diffraction gratings up to 200x 400 mm with or without aberration correction, relief diffraction holographic elements, high power gratings for lasers, including gratings for use in pulse compressions, special gratings for measurements. The company also sells software for diffraction grading design. Currently Holograte counts in excess of 500 organizations as customers and can be considered a true success among many companies. This success has won HoloGrate some recognition. On 8th All-Russian contest "Label Show Russian Style 2002" HOLOGRATE, JSC was awarded with Gold medal in a category "Security labeling application" and an honorable diploma for design of holographic label "Presidential Judo Cup". In November 2001 HoloGrate, JSC was awarded by International Hologram Manufacturers Association (IHMA) for the quality of design and technical standard of a hologram in categories "Authentication & Securit". where Immanuel Kant once pondered the meaning of free will. wedged between Poland and Lithuania). Here on the Baltic shores at the Kaliningrad State University, dynamic holographic research program exists at the Laboratory of Holography of the Radio-physics Department headed by Dr. Michael Gusev, gusev@kvphys.albertina.ru This laboratory have developed a mobile setup for holographic nondestructive testing including vibrations, deformation analysis, the surface relief evaluation. The key element of this setup is a high power frequency-doubled Q-switched laser operating in a single mode with the pulse energy up to 3J. The laser can operate in either a single Q-switched pulse mode or in a double pulse mode with the time interval between the pulses varied in 1-1000 s range. This setup allows measurement of the construction components up to 3x3 meter in the field environment. Modern computer hardware and software allow digital processing and control of holographic recording by using the CCD-cameras as well as the driving and synchronization of laser pulses with needed phases of interrogated process. Application of digital stroboholographic systems provides a possibility for new measurement methods, for example, for investigation of coupled vibrations, vibration in rotating object, compensation of moving object as a whole, etc. The range of applications includes vibration analysis, shock waves analysis, rotating objects study, non-destructive testing of latent defects. The following industrial applications were tested in the laboratory: the vibration analysis of motor, transmission, power frame, body and its elements in automotive industry; the analysis of disk and turbine blades vibrostrength in turbine building industry; amplitude-frequency characteristics of acoustic systems for musical instruments improvement and many others. located 100 miles north of Moscow. Creativity Center in the city of Yaroslavl'. Volga river bend, some 500 miles south-east of Moscow. Headed by Prof. Valerii Ivakhnikh this group' main activities are in the areas of nonlinear optics, dynamic holography, and holographic interferometry. In the laboratory of laser measurements headed by Prof. Vladimir Volosnikov a number of interesting studies have been conducted. It includes research in the control of coherent field structure, vortex light fields, synthesis of holographic filters on dichromated gelatin. Dr. Svetlana Kotova heads another group in the same institute - the laboratory of modeling and automation of laser systems. The research is devoted to dynamic filters on liquid crystals and holographic recording media. In the Saratov State University a group led by Dr. Vladimir Ryabukho specializes in holographic and speckle interferometry. a satellite brunch of the Russian Academy of Sciences). This company, headed by Director Dmitrii Shatunov is yet another artistic holography house that started the commercial activity in the summer 2000. Browsing through the on-line gallery of hologram offered for sale I have stumbled upon a number of interesting, non-traditional and humorous themes (Fig. 4) offered by HoloArt LLC, (http://holoart.narod.ru/indexeng.html )(Be patient, site works extremely slow.). Using the so-called "shock' technology allows the company to create images of falling or moving objects. Currently HoloArt LLC accepts orders for delivery of the complete set of the equipment for holographic studio. A multipurpose holographic system GU-03 is capable of making high-quality reflective and transmission holograms including large-sized rainbow holograms on glass. This compact system is capable of working in adverse field conditions and costs about US$65,000. In addition the company supports a number of research activities centered on medical applications of holography. HoloArt is also engaged in the development of a commercial 3D a projector, capable of creating full color dynamic illusion of volumetric space without extras (glasses). A large variety of rainbow holograms (2D/3D mastering and replication up to 80mm width) for security and authentication applications are also produced at HoloArt. At this institute (http://www.iae.nsk.su/eng/main.html) two groups are involved in the holographic research. Dr. Eugene Pen's group is working on polymer media for the real tiem holography while another group headed by Prof. Vladimir Koronkevich works on design and recording of diffraction holographic elements. At the South-Ural State University the Laboratory of Holography (hologrph.chat.ru) is headed by Dr. Georgii Pyzin,. Its range of activities includes development, production and marketing of holographic equipment for research and education purposes, holographic interferometer. At the Mechanical Engineering Department of Irkutsk State Technical University the group headed by Prof. Alexandr Malov (cohol@irk.ru) studies colloid recording media for holography, including self-developing dichromated gelatin. DOE recorded in such material have unique characteristics since in the absence of processing stress; the gratings can be manufactured up to several millimeter thicknesses with unprecedented selectivity characteristics and large aperture. In addition to the holographic materials research this group is actively involved in holographic and speckle interferometry, and rainbow holography (in cooperation with Media-Security, Moscow). The Fiber Optics Group headed by Prof. Yuri Kul'chin is developing dynamic holographic filters for fiber systems and networks. At the School of Dentistry, the group headed by Prof. Victor Vorobiev is investigating application of holographic interferometry to the treatment of dental and gum diseases (in cooperation with Irkutsk Technical University). referred to as "the mother of all the Russian lands"
Prior to describing the state of holography in Kiev one should mention that the next international conference on "Optical Holography and its applications" is taking place in Kiev, Ukraine on May 24-27, 2004. The Conference is organized by the Ukrainian Chapter of SPIE and Local Section of OSA, Institute of Semiconductor Physics, Institute of Applied Optics and Institute of Physics of the National Academy of Sciences of Ukraine (Kiev) under the auspices of The Ministry of Education and Science and The National Academy of Science of Ukraine. The Organizing Committee includes such leading Ukrainian scientist as Dr. Sergey Anokhov, Institute of Applied Optics http://www.nas.gov.ua/Engl/Inst/309.htm, NAS Ukraine, Profs. Marat S. Soskin and Prof. Mikhail S. Brodin, Inst. of Physics www.iop.kiev.ua, NAS Ukraine, Prof. Vyacheslav Obukhovskiy, Kiev State University, Kiev, Ukraine http://www.univ.kiev.ua/eng/, Profs. Sergey V. Svechnikov and Sergey Kostyukevich, Institute of Semiconductor Physics http://www.isp.kiev.ua/. The topics of the conference coincide with the directions in research and development of leading holographic groups in Ukraine: fundamental properties of 3-D holography (theory and experiments), holographic recording materials; holographic non-destructive testing (methods, systems, applications, cultural artifact restoration); non-linear and coherent effects in holography (multi-beam interaction, Beam Coupling and Combining, Coherent Scattering); Holographic Data Storage; Optical Security Elements. As far as the specifics go, here is a brief sample of the holographic centers in the city of Kiev. "Holography" (www.hologr.com) specialized facility was set up in 2000 in cooperation with the Institute of Applied Physics. "Holography" has been commissioned by the Government of Ukraine to supply the security holograms for its departments. Its field of activities includes development and manufacturing of holographic protective elements (HPE). In the recent years the "Holography" facility has produced HPE for protecting the education certificates for the Ministry for Education and Science of Ukraine, HPE for protecting the documents for the Ministry of Health of Ukraine, HPE for protecting the documents for the Ministry of Transport of Ukraine, 5 kinds of HPE for protecting the forms for the Ministry of Home Affairs of Ukraine etc. Now the facility carries out a large-scale government order for manufacturing HPE for excise marks on alcoholic and tobacco production. The company uses James River Products, Inc. equipment. Optronics (http://www.optronics.kiev.ua/) specializes in design and fabrication of holographic protective elements (HPE) using electron-beam lithography. An International Research Center in Holographic 3D-Sensing has been in operation at the National Taras Shevchenko University of Kyiv for the last decade. It is headed by Dr. Eugene Udalov, and is involved in holography, holographic interferometry, and light polarization studies. Laser department headed by Dr. Anatolii Negriiko develops lasers for applications in holography. At the Odessa State University, Dr. Sergey Gevelyuk heads Physics Department the Laboratory of Holography. Its main activity lies in the field of holography as well as in holographic and speckle interferometry. The group of Prof. Oleg Angel'sky is famous for its works in the filed of correlation optics, speckle interferometry and holography in diffuse optical fields. a Russian Communist Party was held there in 1898. Joint-Stock Company "The Magic of light " was created by joint venture " Holography industry " (Minsk) with engaging of the investments of the Swiss Company " Capital and Business Management - C and BME DV " http://www.holography.by/index_en.php?page=company. This multinational joint-venture company led by Prof. Leonid Tanin is active in printing of security documents and authenticated packaging. Built upon years of internationally acclaimed research acclaimed research in holography and utilizing state-of-the-art equipment the company is capable of origination and in-house embossing of security holograms (2D/3D images and DOT-matrix), holographic protection elements for alcoholic drinks and beverages, etc. The company uses James River Products, Inc. equipment. The company provides holographic security support for the Government of Belarus and its Departments. At Moldova State University a strong program in holography exists. Up until his recent untimely death the program had been led by Prof. Lev Panasyuk who have developed a new method of color image recording on photothermoplastic media (PTPM) . The method consists of recording of optical data by storing a total array of color-separated components with subsequent development. Vitreous chalcogenide semiconductors are used as a photosensitive layer of PTPM. The exposure duration for each color-divided component is set to be long enough to produce photo-induced changes in the properties of the semiconductor layer. Under heating in the field of a corona discharge, surface relief is formed on the thermoplastic layer. Now the head of laboratory of thermoplastic recording is Prof. Oleg Korshak http://www.aif.md/index.asp?id=1932. Prof. Vasilii Rotaru, a head of " Information systems" Center, is also continuing these works. At Pridnestrovskii State University novel image processing systems based on Talbot effect are being developed under the guidance of Dr. Valerii Feschenko and Prof. Alexandr Malov. They also study the self-developing properties in dichromated gelatin structures. In 1995-1997 the same group was developing holographic marking of Pridnestrov'e independent currency. The company uses its own equipment to produce 2D and 3D embossed holograms up to 150mm wide. Kyrgyzstan has distinction of being the only country in the world having a holographer as its President. Indeed, President Askar Akayev is an accomplished scientist. His Dr.Sc. thesis was entitled "Theoretical Principles and Methods of Calculating Holographic Systems of Storing and Transforming Information." A specialist in quantum electronics, holography and optical processing of information, Doctor of Technology, professor and academician of the Kyrghyz Academy of Sciences, Askar Akayev has over 150 published scientific works, including 15 monographs, textbooks and manuals. President Akaev supports the development of holographic R&D in the country. Kyrgyzstan is the only country from the former Soviet Union which is according to IHMA listing has its national currency holographically protected. Kyrgyz company "Aiashuu" (fax: +(996-312) 29-42-28) leaded by Imil' Akkoziev (President) and Akylbek Jeenbekov (General Manager), produces a variety of embossed holograms for products and services protection in the form of hot stamping foils as ready to use self-adhesive labels and laminates. They use their own in-house developed equipment as well as Chinese (SANYOU) and Russian ones. The customers include Kyrgyz Customs inspection labels for tea products (50,000/month), Ministry of Foreign affairs embossed stickers for visas (25,000/year), Ministry of Education for diplomas (125,000/year), alcohol products producers (1 M/year), and many others. The company is known for very reasonable prices of their products and services, which come from the low cost of initial materials for the production. Other company products include holographic portraits of humans and animals on silver halide plates. Almaty, the capital known for the abundant apple crops. Laser center of Kazakhstan Academy of Sciences, and a company AlHol SP (http://alhol.b4b.kz/ , site is in Russian) specialize in rainbow holograms and in holographic interferometry It was founded in 1992 and currently it is the only site in Kazakhstan having technology and equipment for production rainbow holograms used to combat counterfeiting. The company has contracts with the Ministry of Foreign Affairs of Kazakhstan Republic for entry visas (150,000 units), Transport Department (9 million units), Alcohol protection from counterfeiting in Alma Ata city (8 million units), and many others. Another one of the AlHol's lines of business is holographic interferometry equipment. In cooperation with Kaliningrad State University they developed a mobile setup to be used for nondestructive vibration analysis, deformation evaluation, finding hidden defects in construction and many other applications. components up to 3meter X 3 meter square. Institute of Cybernetics inst@cybern.acnet.ge, Dr. Barbara Kilosanidze, the Director of Holoretek Ltd.
Institute of Cybernetics is known for its research in polarization holography in polarization sensitive media since 1975 under the leadership of late Prof. Sharmazan Kakichashvili. Prof. Kakichashvili with his co-workers made physical-chemical and technological investigations on the creation of polarization-sensitive media. In a number of media vector effects were found for the first time also in media with dichromate tritane dyes, mono- and disazodyes, organic photochromic dyes and others, introduced into polymer matrices; in radiant colored glasses, nonorganic photochromic glasses of different sensibilization, and also in hypersensitizing halid-silver emulsions. By now a great number (more than 100) of stable polarization-sensitive materials in a wide range from ultraviolet to red region of visible spectrum had been created and investigated in the Laboratory. The irradiated part of such a material is like a birefringence crystal and can replace the crystalline device in many optical usages and investigations. There are grainless materials and have resolution on molecular level. With the help of the polarization holographic method of recording there appeared the possibility to obtain artificial anisotropic-gyrotropic structures and elements unknown earlier that substantially broaden the possibilities of diffraction and coherent optics. Fine-grained green sensitive holographic plates and film designed for reflection or transmission hologram recording. Average grain size is 35-40nm, resolving power is more than 3000 lines/mm, spectral sensitivity range includes 488nm, 514nm, 526nm, 532nm. Fine-grained red sensitive holographic plates and film designed for reflection or transmission hologram recording. Average grain size is 40nm, resolving power more than 3000 lines/mm, spectral sensitivity range 600-680nm (including 633nm, 647nm). Ultra fine-grained red sensitive plates and film designed for reflection hologram recording. Average grain size is 8-12nm, resolving power more than 5000 lines/mm, spectral sensitivity range includes 633nm, 647nm. Ultra fine-grained panchromatic (full colour) holographic plates and film designed for colour reflection hologram recording. Average grain size is 8nm, resolving power more than 5000 lines/mm, spectral sensitivity range up to 700nm (457nm, 514nm, 633nm). Dichromated Gelatine holographic plates designed for phase reflection hologram recording. Resolving power greater than 5000 lines/mm, spectral sensitivity range up to 514nm (457nm, 488nm, 514nm). Table 1. Holographic plates produced by Slavich, distributed by Geola. The price of the plates can be found on the web site. For example, 25 plates 4x5 inch costs about 200$. (The internal price for plates inside Russia is several times lower). - Various holographic services including archival holography of historical and cultural artifacts. Table 2. Holographic systems offered for sale by Geola. Standa (http://www.standa.lt) is a Manufacturer of opto-mechanical and holographic equipment for research, industry and education with representatives all over the world. Hologramma LTD (http://www.cfi.lu.lv) in Riga successfully applies AChS photoresist in the manufacturing process of embossed rainbow holographic labels, these photoresists are fabricated by thermal deposition method in vacuum are characterized by a very high resolution. This company (fax +371-7260637) is involved in mass replication of holographic stickers. Daugavpils, Difraks Ltd (http://www.difraks.dpunet.lv/english_about.html) was established in 1994 on the base of the Physics department's scientific laboratory of the Daugavpils University. Its lien of business is mass replication of holographic stickers stickers or hot stamping foil (excise marks, tickets, certificates, bonds, drafts etc.)). Over 2,000,000 stickers are produced monthly. These holograms are characterized by the complexity of optical record (origination) of the image and by method of putting hologram on the product. Optical record could be 2-D and 3-D - 2 dimension and 3 dimension images, and Dot-Matrix - image consists of the smallest dots which create animation effect when changing angle of vision. It is my hope that having gone through this short excurse into the state of Russian holography (from holographic nails to top-secret Government document protection) the reader will get an impression that holography is alive and well all over the vast expanses of FSU. While no one can say that the last 10-15 years were easy on the scientists they strong ones have persevered and adapted to the new, market-oriented realities. In place of the old Academic establishments of the Soviet Era a host of new agile and nimble entities have sprung up and some of them prospered in a changed climate. I also hope that a few years from now I will be able to report about new encouraging developments taking place in my home country. 2. Sh.Kakichashvili "The phenomenon of electromagnetic field wave pattern reproduction" - (The discovery). Diploma No.214. The official bulletin of inventions and discoveries. 1979. No.38.